Marvel/Lancer paperbacks (1966-67) | 'TAIN'T THE MEAT… IT'S THE HUMANITY! 1966 was a good year for Marvel Comics. In the preceding four years editor and writer Stan Lee, working alongside a raft of talented artists that included Jack Kirby and Steve Ditko, had transformed the company from a second string publisher specialising in monster anthologies, westerns and romance comics into one of the market’s leader’s. Marvel’s brand of flawed and relatable super-heroes caught the readers imagination, forming the vanguard of a resurgence in the medium, what would later be called the Silver Age of Comics. By the mid-Sixties Marvel were selling 33 million comics a year and word of the publisher’s success spread to the news media – newspaper and magazine articles appeared praising the medium and hailing comics as a new popular art form. Celebrities jumped on the bandwagon – director Federico Fellini counted himself a fan – and Lee was even interviewed by veteran TV news correspondent Mike Wallace. Always quick to spot a promotional opportunity, Lee lectured at Colleges and student halls spreading the word: comics were no longer the domain of children, comics were cool; comics were hip. It’s hardly surprisingly then that Lee and Marvel began to exploit this new found fame by transplanting their characters to other media. Cartoons featuring Marvel super-heroes began appearing on Saturday morning TV, while merchandise licensing went through the roof. The next logical step was to attempt a jump from comics to their nearest neighbour, paperback books. Marvel began to look for a publisher who could repackage reprints of their stories into paperback format and they settled on Lancer Books. It was a canny choice; Lancer had recently scored a huge hit by republishing Robert E Howard’s Conan the barbarian stories from the 1930s. Lancer’s inspired idea of commissioning commercial and comic book artist Frank Frazetta to paint the covers paid off and his interpretation of the brooding fantasy hero caused a sensation, with the books quickly becoming best-sellers (I’ve taken a closer look at Frazetta’s Conan covers here). The Marvel/Lancer collaboration starred some of Marvel’s most popular characters and six paperback volumes were published between 1966 and 1967. Each book sold for 50c, ran to 176 pages and reprinted stories featuring The Fantastic Four, Spider-Man, Thor, The Hulk and Daredevil. 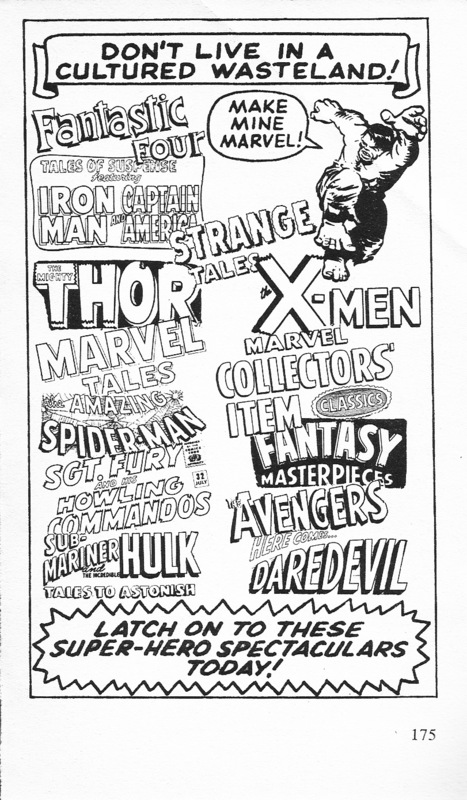 Each book was labelled a Collector’s Album and featured pin-ups as well as a full-page advert for other Marvel titles. 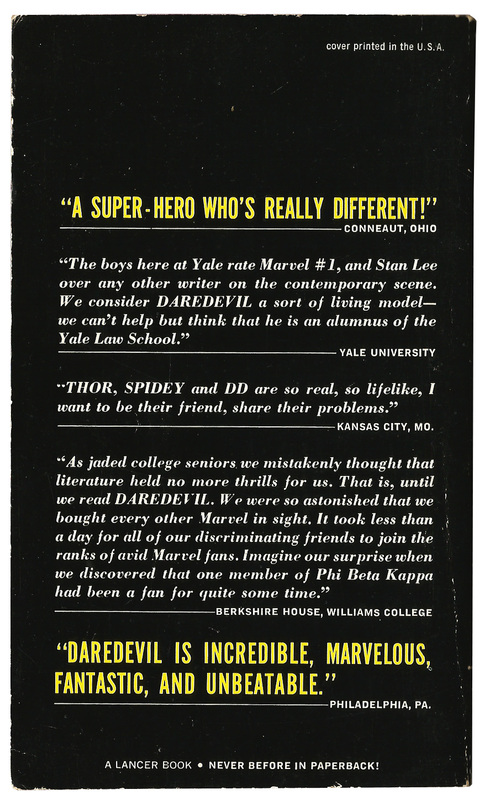 And, in an attempt to reinforce their image as ‘proper’ books, the back covers featured testimonials from respected newspapers such as The Village Voice and The New York Herald Tribune and august institutions as Yale University and the University of Chicago. Unsurprisingly, first out the gate was Marvel’s flagship title The Fantastic Four, published in 1966. 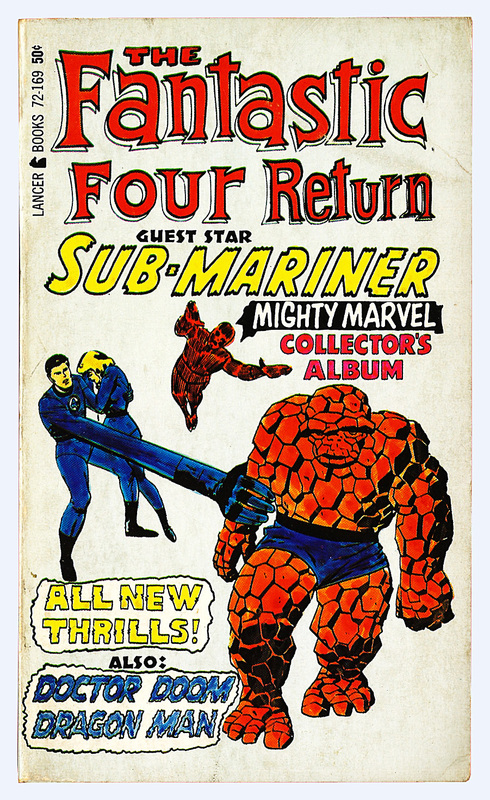 This collection reprinted stories from The Fantastic Four issues #1, #6 and #11, all created by Lee and Kirby. The book also reprinted four full-page pin-ups of the team as well as two featuring FF villains The Hate Monger and Diablo. 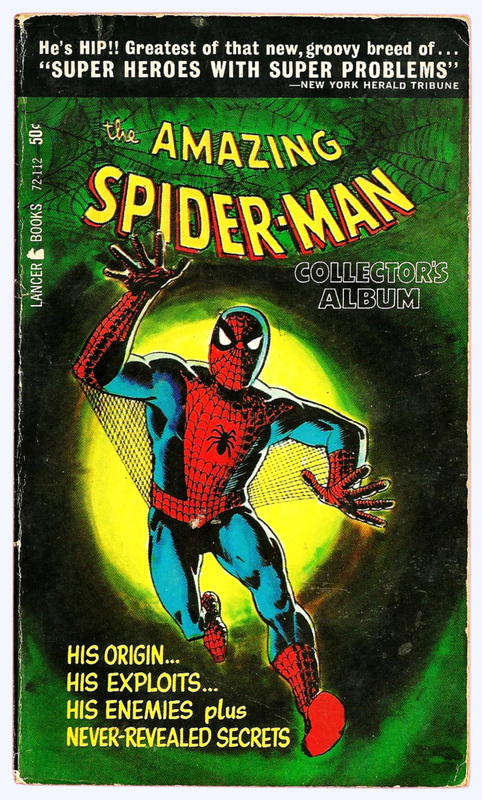 The second volume, also released in 1966, featured The Amazing Spider-Man. Reprinted were stories from issues #1, #13 and #16 of the character’s monthly comic. All the stories were by Lee and Ditko. The book also reprinted parts of ‘Secrets of Spider-Man‘ from The Amazing Spider-Man Annual #1. 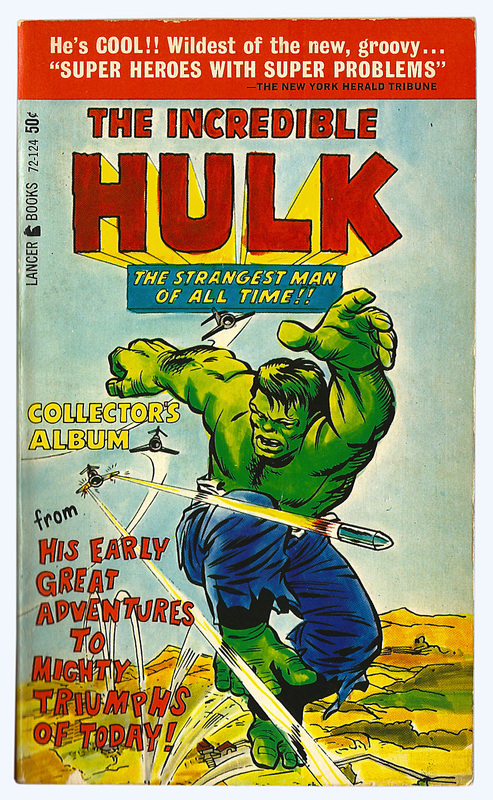 The third book, starring The Incredible Hulk, was also released in 1966. This book reprinted stories from The Incredible Hulk issue #3 and Tales to Astonish #61, #62 and #63. Also reprinted was a full-page Marvel Masterwork Pin-Up of The Hulk. All the stories were written by Lee with art by Kirby and Ditko. 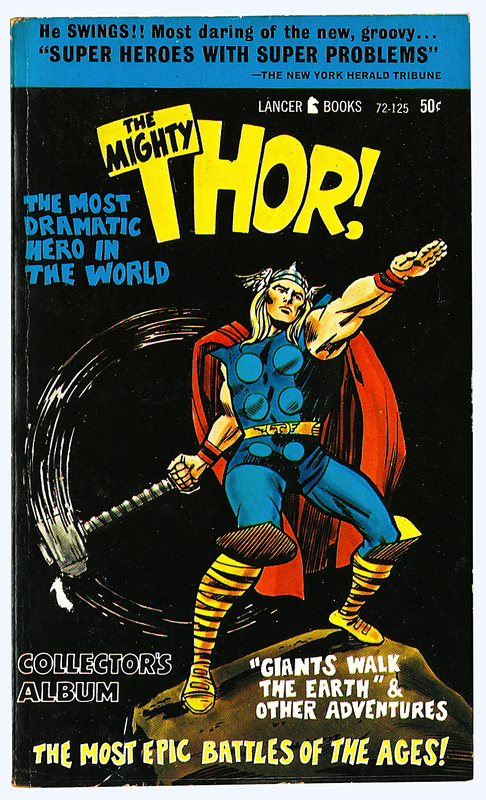 The last book released in 1966 featured The Mighty Thor. Collected were stories from Journey into Mystery issues #97, #104, #144 and #115, all by Lee and Kirby. Also included was a two-page illustration of Asgard and a full-page pin-up of Thor. 1967 saw the release of the final two volumes. The first once again featured the FF in The Fantastic Four Return. This book reprinted stories from The Fantastic Four issues #33 and #35 as well as The Fantastic Four Annual #2. All stories were by Lee and Kirby. Also included was a Marvel Masterwork Pin-Up of Prince Namor. The last collection featured Marvel’s blind superhero in Here Comes… Daredevil. 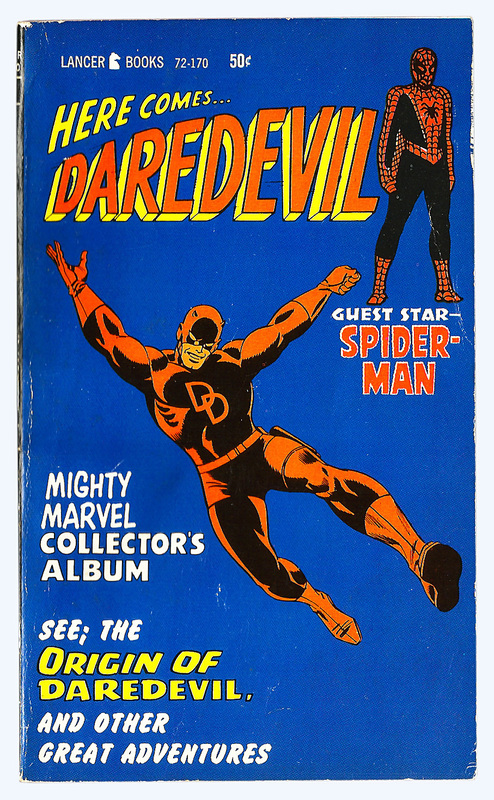 The book collected stories from Daredevil issues #1, #3 and #17, all written by Lee with art by Bill Everett, John Romita and Gene Colan. If Marvel thought they’d be able to conquer the paperback book market they were mistaken. The books failed to spark interest amongst comic, and non-comic book fans alike. Looking back it’s not too hard to see why. First off the books were printed in black and white on cheap pulp paper stock. Gone were the brightly coloured pages that comic book readers were accustomed to. 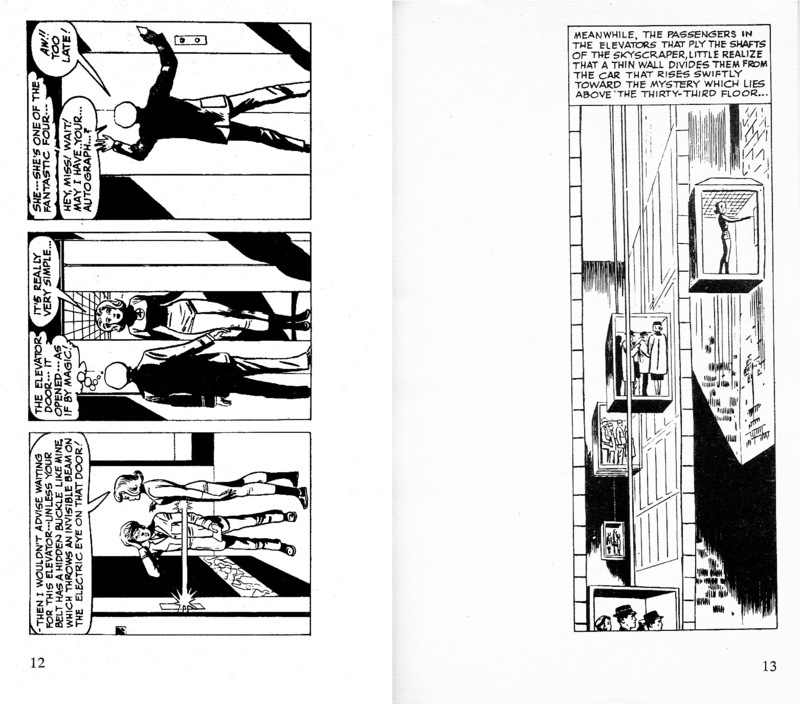 In order to make the stories large enough to read at the books smaller size of 4 x 7 inches the original comic book panels were split apart with two or three panels reproduced per page. Sometimes only one panel appeared on a page, with ungainly amounts of empty space surrounding it. Breaking the panels apart in this way not only spoiled the flow of the story it also meant the reader had to constantly turn the page from portrait (upright) to landscape (sideways) in order to follow the story. That didn’t make for a smooth reading experience. Lancer also tried to give the impression that the books contained one long story so many of the original opening splash pages were removed, while large ungainly captions were added to aid continuity. The covers were also slap-dash – instead of commissioning new artwork Lancer just reprinted elements from the original comic books. 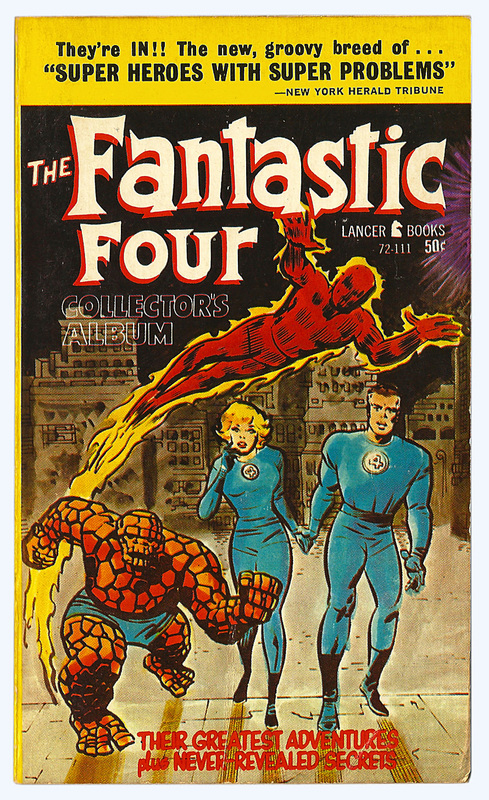 The covers also featured poor reproduction that only emphasised the amateurish colouring – the cover to The Fantastic Four Return looks like it was coloured with marker pen. All-in-all the books felt rushed and cheap – the very attributes critics of comic books had tarred the medium with for decades. Undaunted Marvel would try to broach the paperback market again in 1967 and 1968, this time with two original prose novels published by Bantam Books. Sadly, like their predecessors, The Avengers Battle The Earth-Wrecker and Captain America: The Great Gold Steal also failed to find an audience (although Bantam did learn from one of Lancer’s mistakes – they commissioned original cover artwork). Having had its fingers burnt, Marvel would leave the paperback format alone for a decade. In the late-Seventies, bolstered by the success of their collaboration with Fireside Books (utilising a format that would evolve into the Trade Paperback), they entered into a publishing deal with another Simon & Schuster imprint, Pocket Books (click here for more). These books faired slightly better than the Lancer editions and 10 volumes were released between 1977 and 1980. But ultimately they too failed to carve out a permanent niche in the paperback book market. Although Marvel’s superheroes could overcome almost any obstacle, bridging the gap between comics and books was a battle they just couldn’t win.